We are Angie & David. We have lived all of our married life (42 years as I write) in Bedfordshire and have two adult daughters. We are both now retired. David was born in Gateshead and suspects that his love of the water was implanted into him as a result of living close to the banks of the River Tyne and the North East coast as well as spending many school holidays in the beautiful Northumbrian coastal village of Seahouses. Soon after we were married, we went out for a drive one Bank Holiday Sunday and ended up at Hermitage Marina in Cambridgshire. At that time, (1977) the marina was owned by an extremely nice gentleman and, to cut a long story short, we left the marina having agreed to purchase our first boat. The guy was so kind that he told us we could come back tomorrow with a cheque and use the boat straight away which, of course we did. The boat was a Shetland 535, 17′ long with a 15hp Mercury outboard, built in 1972. It amazes us now to look back at that boat and think of the great times we spent on board, accompanied by our springer spaniel. It was definitely cosy! We spent many happy times on the River Great Ouse before moving on to the Thames at Harleyford (our family had grown so the size of the boat needed to grow!) and then onto the sea at Chichester. Between 1988 and 2011, we cruised (both motor and sail) extensively in the Solent, along the South Coast of England between Dover in the East and the Scilly Isles in the West ,as well as many crossings to the Channel Islands, Normandy & Brittany. We have also experienced limited sail cruising on the East Coast of England and in the US Virgin Islands. Finally we were shareholders in two syndicated narrow boats to satisfy our desire to be boating when we were in the UK between 2007 and 2016. You can read a brief resumé about “Our Nautical Past” and the boats we owned here. 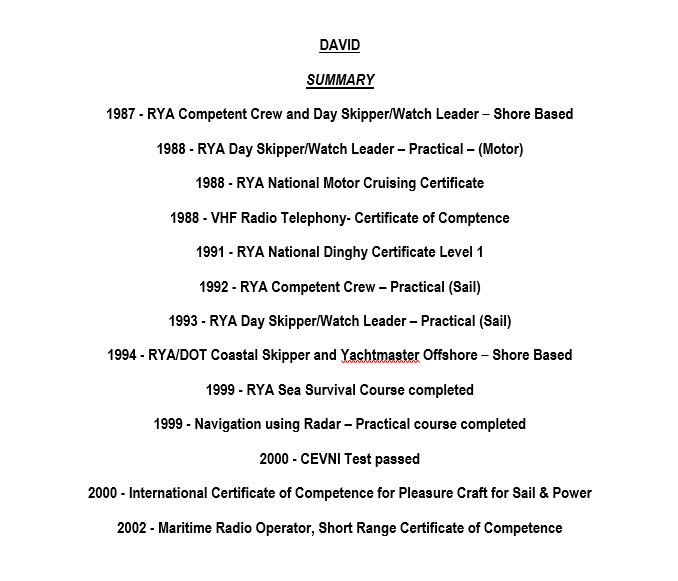 During the course of our boating life David has enjoyed taking part in numerous RYA courses to gain qualifications and experience and you can see his resumé here. Angie has completed RYA Competent Crew (Motor) and RYA Competent Crew (Sail) too. We have been almost constant boaters apart from periods between 2007 and 2016 when we spent a considerable amount of our time travelling the USA and visiting 38 States in a recreational vehicle (RV). Whilst many folk refer to RV’s as Winnebago’s our were manufactured by Tiffin Motorhomes Inc. in Red Bay, Alabama. We bought them both new, built to our specification (they were the same model, just a different internal layout) and we can thoroughly recommend both Tiffin and the RV lifestyle. We are now very much looking forward to launching our new Piper 57N replica Dutch barge and living on board back on the Thames for the first year, before we head over to the European canals.